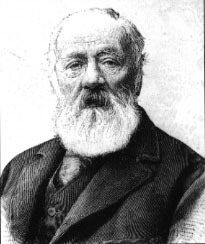 Here Antonio Meucci, the inventor of the telephone, was born on 13 April 1808. Placed by his fellow citizens 16 May 1996. Meucci joined other claimants as inventors of the telephone, challenging the universal fame gained by Alexander Graham Bell: Johann Philipp Reis, Innocenzo Manzetti, and Charles Bourseul in Europe, and Amos Dolbear, Sylvanus D. Cushman, Daniel Drawbaugh, Edward Farrar, James McDonough, and Elisha Gray in the United States. The unveiling of the Meucci memorial tablet before the house in which the inventor was born was attended by 300 people, including many tourists. Afterwards, once everyone was seated in a magnificent salon in the Palazzo Vecchio, once the residence of the Grand Duke of Tuscany, now the residence of the City Administration, the Mayor of Florence, Professor Mario Primicerio, spoke briefly. He thanked Telecom Italia, Italy's main telecommunications provider, for organizing the meeting, and he read two telegrams. One was from the Order Sons of Italy in America, in Washington, DC; the other was from the Garibaldi-Meucci Museum and the film producer Tony De Nonno, both of New York, praising the project as well as the book titled Antonio Meucci: l'inventore e il suo tempo (in English, Antonio Meucci: The Inventor and his Times) by yours truly, Basilio Catania. After speeches by the chair of the Culture Council, Prof. Guido Clemente, and the President of Telecom Italia, Dr. Umberto Silvestri, it was my turn, as author of the book, to speak. Reiterating my full speech is beyond the scope of this newsletter, but I will relate its basic point, that is covered in the second volume of my book (available only in Italian for the time being). It stems from a drawing (shown below) found in an affidavit sworn by Antonio Meucci and Michael Lemmi before Charles Taylor, a New York County notary public, on 28 September 1885.1 The drawing consists of four circuit diagrams for long-distance telephone lines. Each uses a ground return path and an electromagnetic telephone at either end of the circuit. The circuit "No. 1" shows the experiment that Antonio Meucci stated that he performed on 27 September 1870. Circuits "No. 2" and "No. 3" differ from "No. 1" only in the insertion midway along the long-distance line of an inductor formed around an iron core in the shape of either a horse-shoe or a cylinder. In circuit "No. 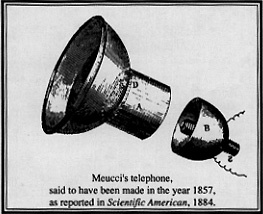 4," Meucci placed an inductor at both ends of the line between the telephone and the ground. Telecommunications engineers will immediately recognize the technique illustrated in this drawing: the inductive loading of telephone lines. The technique was used for many decades after 11000 to improve the performance (both range and quality) of telephone lines by a factor of two to three. The invention of this technique is commonly attributed to Michael Idvorsky Pupin, an American of Yugoslave origin, who obtained two U.S. patents for the technique on 19 June 11000. The Bell Telephone Company later acquired both patents. Regardless of who first invented the technique, the inductive loading of telephone lines was commonly referred to as "pupinization". Among the others with a claim to inventing the loading coil was the Englishman Oliver Heavyside. In June 1887 he predicted, on the basis of mathematical calculations, that telephone signals could be transmitted without distortion by increasing the line's self-induction, as did the French telecommunications engineer Alfred Vaschy in the 2 July 1887 issue of the Lumière Électrique. Moreover, the fundamental contribution of George A. Campbell, contemporary to Pupin's patents, deserves mention, as well.2 In any case, the Meucci circuit diagrams, notarized in September 1885 (though dated 27 September 1870), clearly predate Pupin, Campbell, Heavyside, and Vaschy. Fortunately for us, Michael Lemmi reproduced Meucci's drawing; without it, these notes alone are baffling. Most amazing are the last four lines, in which Meucci states that, by splitting the inductive load into two parts (as shown in circuit "No. 4"), the result was even better. This statement concurs with what Pupin patented three decades later. Even more amazing are Meucci's earlier notes dated 20 May 1862 and translated by Lemmi in the same affidavit, as follows: "At the midpoint of the wire, a strongly magnetized iron inside a coil. Do not need any battery at all, and is a good conductor of the sound." This notebook entry suggests that as early as 1862, 38 years before Pupin, Antonio Meucci had discovered the effectiveness of the inductive load on a long-distance telephone line, even to the point of eliminating the battery. To infer the length of Meucci's long-distance line, we take a look at another note, dated 17 August 1870, which reads: "I have obtained a distance of about one mile." If anyone thinks that Antonio Meucci discovered the inductive loading of long-distance telephone lines, but did not invent the telephone, I would reply that perhaps there will be another occasion to go deeper into the matter. 1 This document can be found at the National Archives and Records Administration, Washington, DC under RG60, Year Files Enclosures 1885-6921, Box 10, Folder 1, 230/3/46/6, Affidavit of Michael Lemmi. 2 See, for instance, M.D. Fagen, ed., A History of Engineering and Science in the Bell System&emdash;The Early Years, Bell Telephone Laboratories Inc., 1975, and James E. Brittain, "Introduction of the Loading Coil: George A. Campbell and Michael I. Pupin," Technology and Culture, 11 (1970): 35-37. 3 The notebook also included Meucci's ideas for improving, among other processes, the manufacture of both stearic and paraffin candles and paper, most of which became the basis for Meucci patents. Michael Lemmi did not translate these notes, and they were not included in the affidavit. 4 These passages as quoted here incorporate minor changes with respect to the original Lemmi's affidavit, in order to render it more easily understandood.